I'm not sure if this belongs in "Support" or "Lineup Issues", but I'm seeing interesting behavior on one of two "custom" lineups (channels deselected). A little background, my rural cable company made a lineup change roughly a year ago when WB switched to CW. They were carrying WB from out of state and replaced it with an in-state CW. I waited a bit and noticed Zap2it didn't reflect the change. I emailed labs a few times but, a year later, the lineup/schedule is still incorrect. I don't blame Zap2it; I fully expect it to be a lack of communication on the part of the local (small) cable co.
My workaround was to create two lineups, one for the local cable co (minus the incorrect channel) and one for the larger city cable co (minus everything BUT the "new" channel). The channel numbers were different so I worked some magic in MythTV to make everything display/schedule properly. Now that I'm an SD customer, I've created the same setup using the lineup editor and am using XMLTV to download listings since I can't/won't upgrade Myth at the moment. When I download the first lineup, everything except channel 4 from the local cable co, I get an xmltv file that has, as expected, all listings except those for channel 4 (deselected from lineup). Downloading from the second lineup, I get a full data file including listings for all channels, instead of just the one I've selected in the GUI. 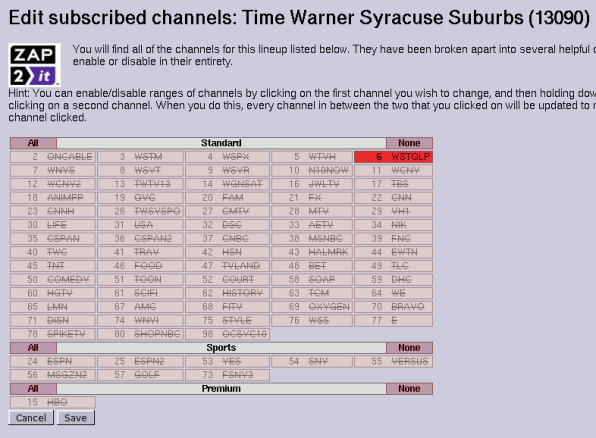 I've double-checked the second lineup in the Schedules Direct editor and it has all channels except channel 6 disabled. I'm curious as to why the second data download includes ~70 channels when it should only have listing data for one. This isn't causing a problem, aside from wasted bandwidth, as I'm only really using the data for channel 6 in the second lineup and the rest winds up being discarded. I'm just curious if anyone has run into this before or if what I'm seeing is indeed expected behavior. I am assuming this has nothing to do with xmltv because, if the server wasn't offering the data, xmltv wouldn't download it, right? DD always sends all the data for all lineups. XMLTV only supporting a single lineup is a local filter. (same with excluding channels via XMLTV --config... they are still downloaded). That's why it's recommended if you use multiple lineups, you save the data with --dd-data and just --reprocess the --dd-data file to avoid another (identical) download on the second instance. Are you processing the XMLTV formatted file or the --dd-data? If you're using --dd-data, that's the expected behavior. You can also add --download-only to not even generate the XMLTV file. If you are using the XMLTV file, please throw the two config files and --dd-data output in a zip file and send it to me. You can try the links (PM and/or email) in the forum (would be nice to know if that worked), or email them to rmeden@yahoo.com. If you want to blow away your passwords in the config files, that's fine... I won't need them. I should add that if you are running the 0.20.2 release, or the latest 0.20-fixes or head from svn, then MythTV will cache the downloads for the full course of the mythfilldatabase run and so will only download the data once and reuse for the different lineups. rmeden wrote: DD always sends all the data for all lineups. I could not find an option under board email or pm to send attachments, so I sent you my config and resulting data via email. It's possible I misunderstood the function of lineups in my account on the Schedules Direct server. I've attached screenshots of my two lineups as seen in the Schedules Driect lineup editor. I assumed that selecting or de-selecting channels would affect the data offered for download. If that's not the case, then I can understand why all the channel data is being downloaded. Thanks again to Robert for helping to set me straight.